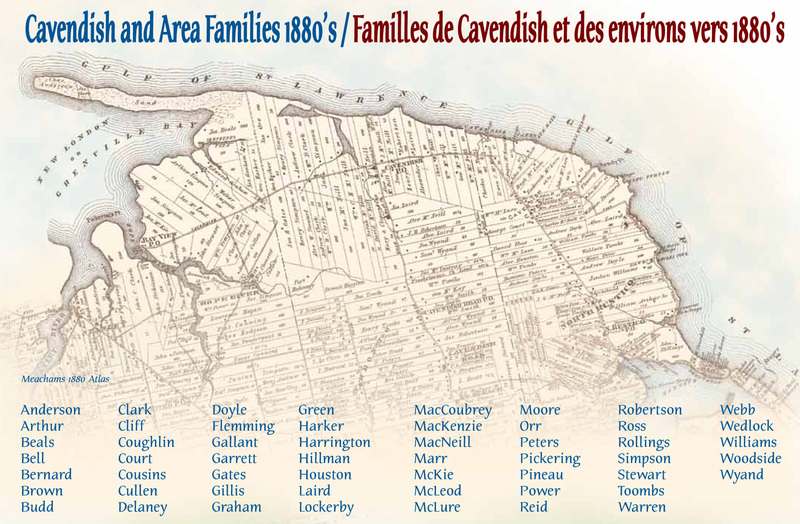 The Meachams 1880 Atlas illustrates how well the Simpsons, Clarks and MacNeills prospered during the 90 years following their arrival to Cavendish. During this time they were joined by many other families who moved into the surrounding areas and established homesteads. These early families made their living from the land and sea that surrounded them. They were involved in farming, fishing, lumbering, shipbuilding, milling, trading and shipping. At the provincial land registry office records show that on August 31, 1789 William Simpson leases 500 acres from William Winter, the proprietor of Lot 23. There is some question as to if William and his sons came to build a cabin for the family to return to the following spring. It is known is that the spring of 1790 that William and his family packed up their possessions, supplies and livestock and moved to Cavendish to establish a permanent home there on their leased land. William and Janet Simpson brought their five youngest children: Jean, James, Jannet, Charlotte and John, ranging in age from 22 to 11 years; as well their daughter Helen and son-in-law William Clark; and their son William Simpson Jr. and his new bride Mary Miller of Covehead. In 1791 they were joined by their daughter Margaret and son-in-law John MacNeill. On April 1, 1791 John MacNeill leased 100 acres east of the Simpson property and on September 22, 1803 he leased another 400 acres as shown on the 1809 survey, prepared by Robert Fox. The survey also shows the location and boundaries of William Simpsons original 500 acres lease which actually includes 565 acres, the land was divided amongst himself, two sons and one son-in-law.